In the hierarchy of cooking blogs, Deb Perelman’s Smitten Kitchen is at the top of the heap. She’s often mentioned in lists of the best food blogs (see Daily Meal, for example). My coworkers talk about her recipes all the time. She even published a cookbook earlier this year. Pretty amazing when you consider she does all this out of a 42 square foot kitchen. When I was looking for ideas for recipes for holiday entertaining, Smitten Kitchen was one of the first places I turned. She has a good recipe index, making it easy to find recipes by type. It’s what inspired me to have a recipe index for Cook In / Dine Out. My Christmas-themed silicone spatulas that I bought on clearance at Sur La Table are happy they don't feel out of place in the kitchen this time of year. Perusing her list of appetizers, the Baked Chicken Meatballs caught my eye. 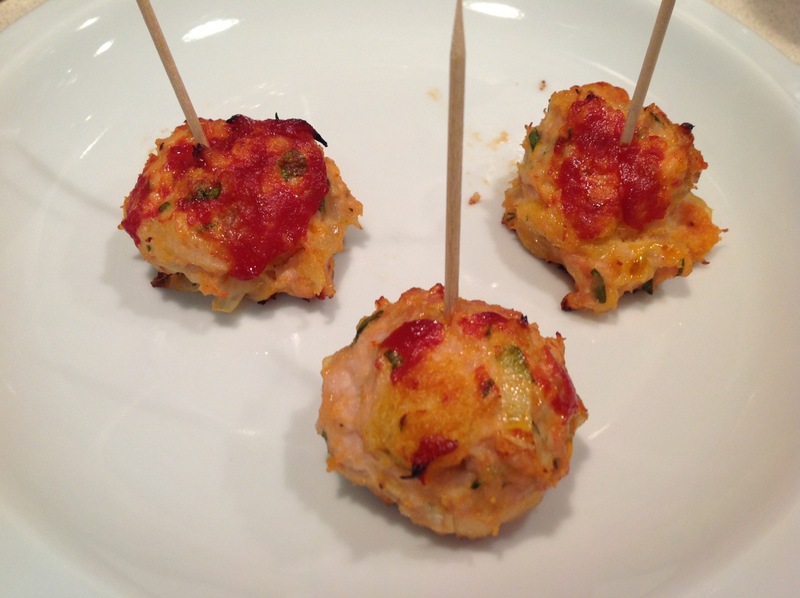 As an entertaining food, meatballs are perfect, since they are bite size, can be eaten with a toothpick and aren’t messy. Deb’s recipe called for ground chicken and pancetta, but as luck would have it, Whole Foods had neither the day I picked up my ingredients. So I substituted ground turkey and bacon, which worked fine. The tomato paste and oil do not really mix together completely. 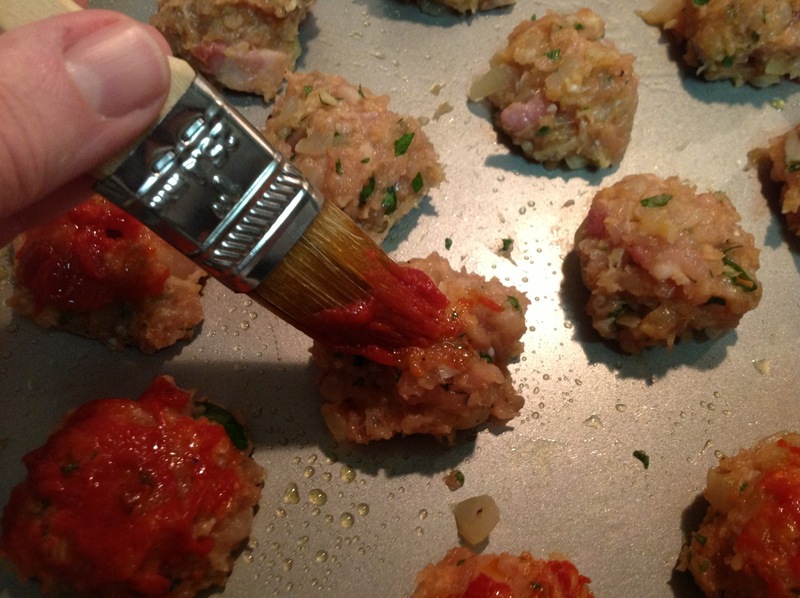 Nonetheless, a regular brush still works well for glazing the tops of the meatballs. I followed her instructions to glaze the meatballs with tomato paste and oil, and I agree they did not mix well. Other glazes would probably work well too, such as a smoky-sweet barbecue sauce. 1. Move oven rack to upper-middle position and preheat oven to 400 F.
2. 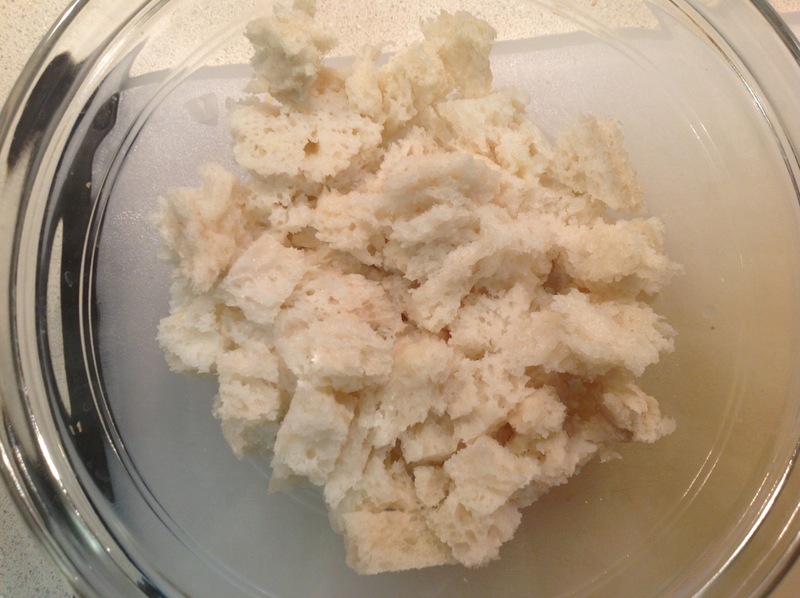 Combine bread chunks and milk to soak in a small bowl. 3. Heat a large skillet over medium heat. 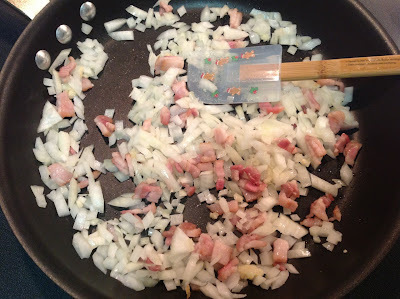 Add bacon and cook by itself for a couple minutes to render fat. Add onion and garlic and sauté until softened, about 6 minutes. Set aside. 4. Squeeze bread to remove excess milk and then discard the milk. Add soaked bread, bacon, onion, garlic, egg, ground turkey, 1 tbsp. tomato paste and parsley to a large bowl. Combine with your hands or a large spoon until well mixed. 5. Form mixture into meatballs of desired size (note: I wanted smaller bite-size meatballs just over an inch in diameter, for which this recipe made 27 meatballs. Smitten Kitchen’s recipe calls for much larger meatballs, yielding about a dozen). 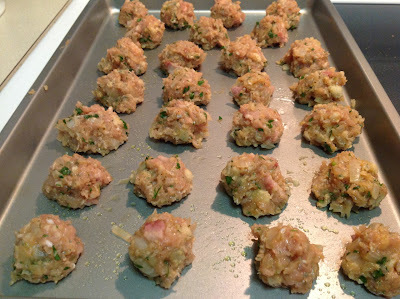 Place meatballs evenly spaced on a rimmed baking sheet. 6. Combine 1 tbsp. tomato paste and olive oil in a small bowl. Brush onto the top of the meatballs. 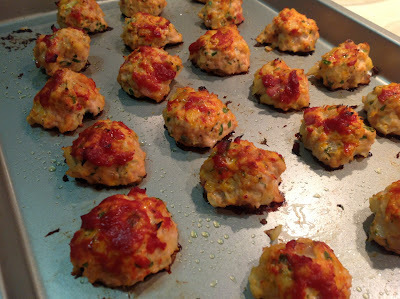 Bake in the oven until meatballs are cooked through to 165 F, about 15-20 minutes (note: the size of the meatballs will affect cooking time. Deb said her meatballs took 25 minutes, probably owing to their larger size. Mine were done in 20 minutes). These were tasty. I like the idea of making them with a smoky-sweet barbecue sauce too.